I unloaded the kiln on Thursday, and it was a very good batch of pots. The colors are very vivid and full of energy. On the left you can see one of the large jars that I finished. The formal shapes begged for some loose poured glazing, and I couldn't be more happy with the results. The Computer chips are in slots in the sides. The jar is close to 2 feet tall. 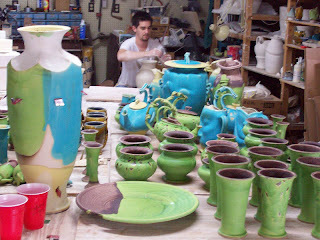 In the background you can see Edan, my apprentice, working on a large pot. He has learned to throw large forms, and he has learned VERY quickly. This is one student who will surpass me in ability. I love having his energy around, it helps me to be more creative and energetic. These are some pieces that I am creating for a client in California (San Diego). 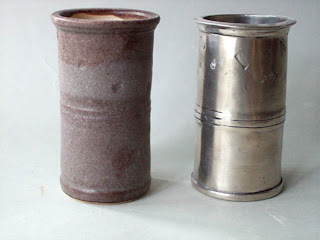 The piece on the left is my creation, the pewter piece on the right is the item that I am replicating. The glaze on my piece still needs some work, but The shape is coming along. The "beaker" on the right is a replication of a 16th century Italian measuring beaker that has stamps impressed on it as an official certification of it's accruacy. My replications of the replication are in porcelain, and they are used for floral arrangements. There are 5 different sizes for the company events. What fun!